Listen to 1.15.19 Hagmann Report. 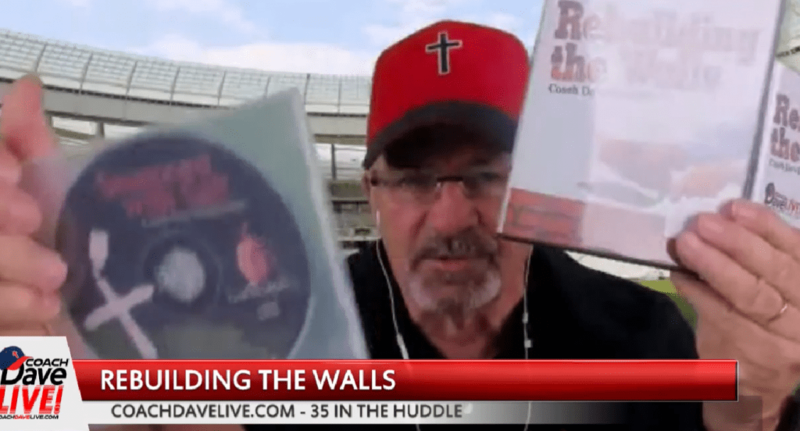 Donate $50 or more to Coach today, at www.coachdavelive.com/donate and receive an audio and DVD set of “Rebuilding the Walls” teachings. Also receive a double CD set of other excellent teachings by Coach. Keep praying for the brothers and sisters in need. Todd B. s doing better. He’s been transferred to another hospital. Brian C. is doing better after his serious injury 6 weeks ago. Praise God! There’s an assault on masculinity. This ministry is a “doing” ministry. It is to motivate people to get out there and do it! Take it and run with what you’re learning. We’re not here to just spoon feed you in a daily Bible study. We should live with a Bible in one hand and a newspaper in the other. We haven’t come out of the ink and paper of the Bible. We’re not making the connections between the Bible and real life! We’re still in the printing press spiritually, when we should be in the internet age. Don’t get stuck in the Christian box. Stuff is being revealed through science, that confirms the Bible. Question: Are we born into original sin? What is original sin? Did we inherit sin from Adam? Are we born into sin? Do we have Adam’s DNA? Gotquestions.com. What happened in the Garden of Eden with Eve, the serpent, and Adam? Did the DNA change, inside Adam and Eve, after they sinned, which was passed on to everyone else? What made them desire to put on a fig leaf? Does this have to do with DNA or something else? How did everybody after Adam and Eve become sinful? What about a generational curse? From a data standpoint, it has to do with frequencies. All these frequencies are damaging our DNA. Our DNA can be changed to reduce our lifespan, and the canopy protecting us from the sun is corrupting our DNA. After the flood, people no longer lived 1000 years. It was reduced to under 200 years. Adam had a lifespan after he sinned. But he was originally created not to die physically. Critical thinking question picks up with – Adam and Eve sinned and that caused a change in DNA. A new life spark happens when a sperm and egg join and God blesses causing a spark of life. Scientists cannot create a DNA that causes the spark of life. The unique spark is only by God. But DNA causes our bodies to eventually die. But if our sin was encoded on Adam, what about our sin? Is sin encoded to our offspring? Genetic disorders are caused by DNA. Hereditary damage can cause curses through generations. How does God pass something down starting with a man, Adam? All of a sudden Adam and Eve knew they were naked. What changed in their heads? No one told them they were sinful. What if my sin is carried ahead with my offspring? Not only your DNA but the habits you form. What about healing? Is Jesus’ healing available to our bodies’ DNA, when we become born again? Did Jesus get healed after He died, and give off a gamma ray, radiating the Shroud of Turin, when he came back to life? David Arthur became healed after he decided to read the Bible and repent, while on his death bed. When you become born again, is your DNA changed? Knowledge of good and evil can lead to more sin. 2 Corinthians 17 says we, as Christians, are a new “creation” (original formation) in Christ. When you are born again, your DNA is stored, and restored. The sins of the fathers “visit” the sons. They don’t necessarily come in. You can come to a house, but if they don’t let you in, you are not in. Our children do not have to have our problems. Knowledge helps them be aware of what to let in. Romans 6 says the old man dies. The old DNA dies. Early on in the Old Testament, Enoch petitioned God to save the people of his day. God reprimanded the people. After the Flood, Ham, Shem and Japheth’s wives were the only ones giving birth, initially. Ham saw his father naked and was cursed. His offspring became whom? Arabs? Nephilim suffered before the flood. Ham’s offspring became cursed, after the flood. Psalm 106 – they shed and mingled their own blood. What does this mean? God cursed people. Arabs? In the land of Shinar, the Middle East? Unless they turn to God, they are a powder keg, and can be burned up because of the oil in the earth below them. Arabs also have many DNA irregularities. They’re too numerous to count. Sickle cell anemia, and many other diseases are present in Arab DNA. Lots of food for thought. Search out the truth yourselves. Be diligent and ask the Holy Spirit to reveal truth to you through the Scripture.